How many women have stood in front of the mirror, maneuvering and contorting their face in such a manner to yield a more youthful result? If you are bothered by the signs of aging on your face, a facelift may be right for you. Technically known as rhytidectomy, a facelift is a surgical procedure to improve visible signs of aging in the face and neck. Aging and gravity can cause sagging in the midface, deep creases below the lower eyelids and along the nose extending to the corner of the mouth, displaced or fallen fat, loss of muscle tone in the lower face to create jowls, and loose skin/ excess fatty deposits under the chin and jaw, forming a “double chin”. Most patients who request a facelift feel that their facial features do not reflect their youthful spirit and energy level. They are looking for ways to refresh and rejuvenate their appearance. It is this moment when a facelift becomes a great option to look younger and deliver a more radiant you. The facelift procedure has continued to evolve over time. Many different techniques exist, with outcomes that are consistently reliable and durable, including a traditional facelift and limited incision MACS-lift. A traditional facelift incision often begins in the hairline at the temples, continues around the ear, and ends in the lower scalp. However, the MACS-lift, Minimal Access Cranial Suspension, uses a shorter scar that is in front of the ear which is easier to hide, however is reserved for patients with less advanced signs of aging. Your plastic surgeon will decide which technique best suites your expectations in regards to the degree of aging. Regardless of the technique utilized, a facelift procedure can take from two to four hours with general anesthesia. Excess fat and skin are removed from the face to tighten and improve the patient’s facial contours with volume and shape restoration. Fat may be sculpted or redistributed from the face, jowls, and neck, and underlying tissue is repositioned. The skin is then redraped over the uplifted contour and excess skin is trimmed away. With a MACS-lift, there is limited skin undermining and permanent stitches are used to re-suspend the deep structures of the face to reverse the gravitation signs of aging. The skin is then repositioned and closed with sutures. A facial dressing is applied to minimize swelling and bruising. In addition, a drainage tube(s) may be placed to collect any excess fluid or blood that may accumulate under the skin. Rejuvenation procedures typically performed in conjunction with a facelift to optimize results are liposuction; browlift to correct sagging or deeply furrowed brow; eyelid surgery, also known as blepharoplasty, to rejuvenate aging eyes; neck lift, also known as platysmaplasty, to tighten and improve an aging neck; soft tissue augmentation with structural fat grafts to restore volume loss, and resurfacing techniques, such as dermabrasion, laser skin resurfacing and chemical peels. 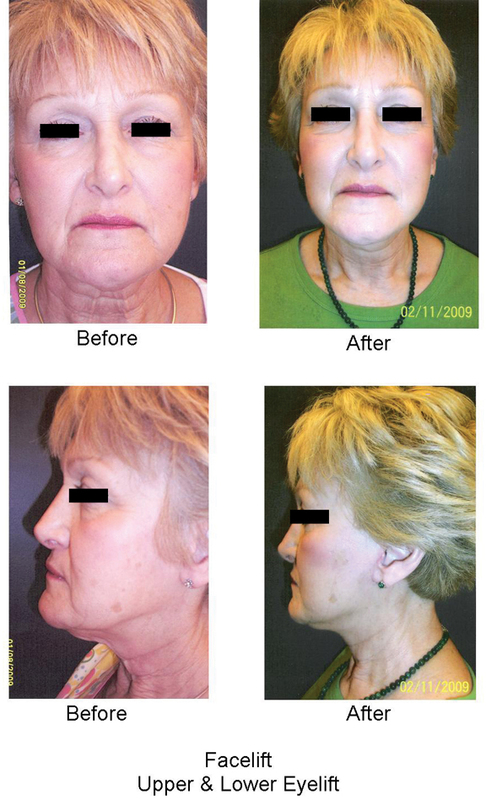 Facelift surgery will produce long lasting results; however, healing takes several weeks. After the procedure, there will be swelling and bruising. The visible improvements of a facelift appear as this swelling and bruising subside. It may take several months for swelling to fully dissipate and up to 6 months for incision lines to mature. A facial garment will be worn to protect the areas where the incisions were made. Once healed, the incision lines from a facelift are well concealed within the hairline and in the natural contours of the face and ear. A scar management program will also be initiated to assist with a more aesthetic appearance. 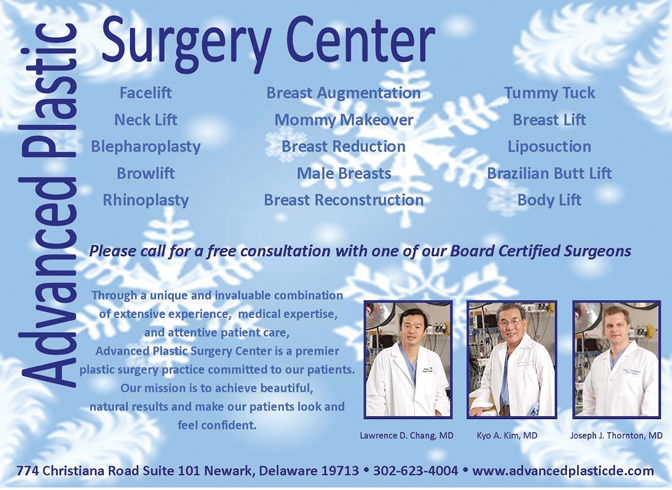 Patients who undergo facelift surgery look younger and feel more refreshed with their new rejuvenated, natural look. A person who has had a facelift may easily take away 10 years from their appearance. However, as a restorative surgery, a facelift does not change your fundamental appearance and cannot stop the aging process, both natural and those caused from external factors including sun damage and smoking. Therefore, life-long sun protection as well as a healthy lifestyle will help extend the results of your rejuvenated, more youthful appearance. The benefits of a facelift can be enormous! Your final result should not only restore a more youthful and rested appearance, but also help you feel more confident about yourself. The results are a reversal of the effects of gravity and tightening of the soft tissues of the face to restore a more youthful contour of the face. Ultimately, a facelift will allow you to turn back the hands of time to better reflect your youthful spirit. 774 Christiana Road, Suite 101. ← Previous Story Arthritis Relief is Here!